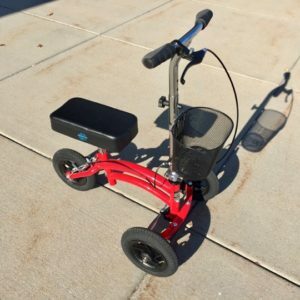 Rent the Junior Rover All Terrain Knee Scooter today If you’re 5’4″ or shorter this is the perfectly designed knee scooter for you. Both compact and comfortable, with ideal mobility, the Junior Rover is a great knee scooter option for rental in Denver. The Junior Rover offers pump-up pneumatic tires, provides a lot of comfort and safety. 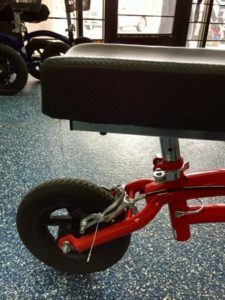 And like many of the other all-terrain models, the Junior Rover has a tie-rod, keeping your wheels together when you ride over bumps. This bright, lightweight, small tired-knee scooter is a real space-saver. The size makes it a simple model to store in your car for easy transportation around town. 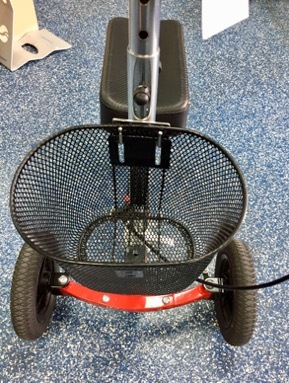 The Junior Rover also has a small basket, designed for carrying a wallet, small purse, phone, and keys. It’s not as big as other baskets, so if you want a larger basket, you’ll want to find a different model that fits your needs. Adjust the height of the seat to fit your body’s frame. 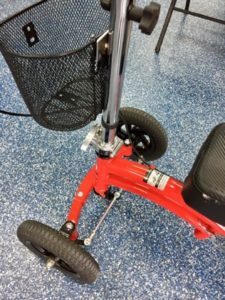 If you’re a child or a small adult, you’re going to find this knee scooter fits you perfectly. The Junior Rover, like many knee scooters, can easily fold-up with a quick release, making it convenient for easy transport. 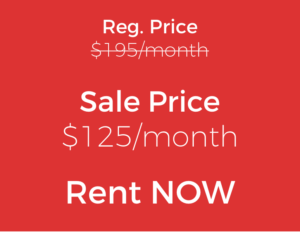 If you’re shorter than the average adult, and you want a stable all-terrain knee scooter, call us today and rent the awesome Junior Rover today.